Manufacturer & trader of Electric Control Panels for Boiler. 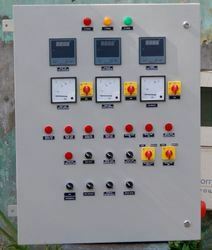 Our product range also comprises of Fly Ash Brick Machine Control Panel, Electrical Control Panel and Electrical Panels. We supply best quality of Control Panels for Boilers. They have PLC control logic, which is connected to main controller. They are very adjustable. They are very sturdy and reliable. It has a control panel with indigenous electronic circuits. We provide them in lots of color. It has AutoCAD drawings for its controlling unit. They are connected with lots of components. These are used for the Safety for product and operating tool. Looking for Control Panel for Boilers ?